Region: This beetle can be found in the eastern portion of North America. 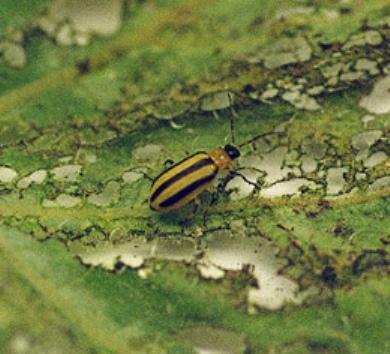 Life cycle: The Adult beetle overwinters in plant debris. Only one generation is produced by beetles in the North, while in the south two to four generations are common. Physical Description: The adults are distinguished by the pale yellow to orange wing covers with three longitudinal stripes and black head. It grows to a 1/4 inch length. Feeding characteristics: The adults chew on leaves and flowers and carry Bacterial Wilt and cucumber mosaic, while the larvae feed on stems and roots. Controls: Nature provides a lot of control in the form of natural predators, such as, Soldier Beetles, Tachinid Flies, Braconid Wasps and parasitical nematodes. However, you can also try covering your plants with cheesecloth, or infestations that are more serious, dust or spray with rotenone.